Black Ice Software - Tiff Viewer version 11.30 is released! Tiff Viewer version 11.30 is released! Multi-page change tracking, Improved Saving, Undo and Insert Page(s) features and multi-page support for Flip, Rotate, Color Mode, Document Cleanup operations! 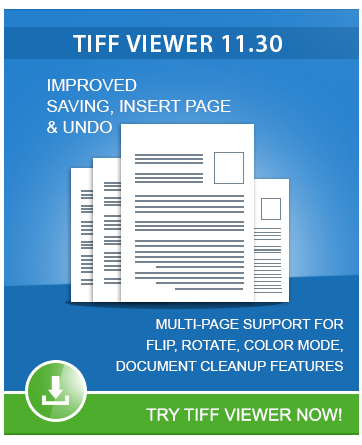 Black Ice Software has released version 11.30 of the Tiff Viewer including new multi-page change tracking, resulting in major improvements in the Saving, Undo, Insert Page(s), Flip, Rotate, Color Mode and Document Cleanup features! Version 11.30 of the TIFF Viewer Server allows users to navigate between modified pages of a multi-page document without saving the file, resulting in a more smooth and user friendly usage. The latest release of Tiff Viewer also includes improved Undo features allowing users to undo 16 operations including Multiple page deletion, insertion and page moves. To read more about Tiff Viewer, please click here.